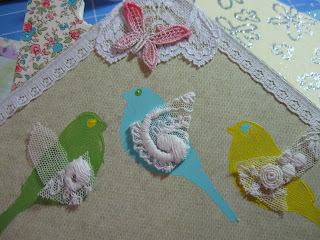 Dear Friends.....I am working on a cute house book. There are 8 pages inside to decorate....I painted the cute little birds and the flowers with acrylic paint and added some touches of lace for their wings. Each page will have a different theme. When finished it is sturdy enough to stand up for display.